Everyone is unique. We personalise our services to fit your individual situation. Established in 1994 Meadow Lodge Home Care Services has extensive experience in all aspects of care in your own home. We believe our personal care services should be tailored to your specific needs and circumstances. We make the time to get to know you and provide you with the right care to make life easier. Understandably, our clients demand a high level of choice and control over the way they live whilst maintaining their dignity and respect. Because each person has a unique set of circumstances, we tailor our services to you. It is vital that you are the one making the decisions about what you need, whether it is an hour to keep your house tidy or 24 hour care. The CQC's job is to make sure that care provided by hospitals, dentists, ambulances, care homes and services in people's own homes and elsewhere meets national standards of quality and safety. Karen Shann is the owner and registered provider of Meadow Lodge Home Care Services. She has worked in health and social care since 1975. Meadow Lodge Home Care Services was started in 1994 and was based at Meadow Lodge Care Home in Kellington, which Karen also owns. Due to the growth of the business the Care Sevices moved into their own office premises in 2010. 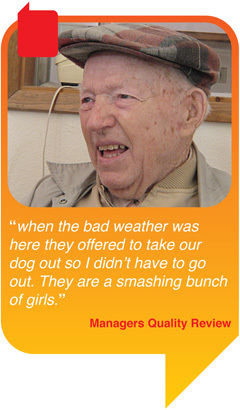 The Meadow Lodge Care Home Inspection report can be viewed here. Meadow Lodge Home Care Services are proud members of UKHCA and ICG Yorkshire.